Getting families involved with special school events and activities is an essential part of a PTO’s or PTA’s success. Family events give the community something to look forward to and a way to spend time together. And just as important, prioritizing events lets families know you want them to be part of the school community in a fun, feel-good way—which helps them see your group as something they want to get involved with. Our free Family Event Planning Kit covers the key steps in choosing and executing meaningful and fun school events for your parent group. From small get-togethers to major festivals to everything in between, start bringing families together and build the bonds of community. To create a tradition: A high-profile or signature event like a carnival can rally your school community, build excitement, and result in a cherished school tradition. Planned well, lower-key events like Family Movie Night can also have a lasting impact. 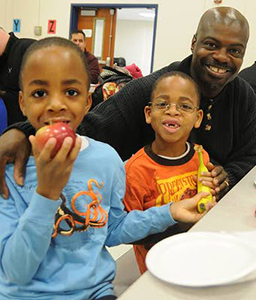 To bring school families closer together: It’s not always easy for families to get to know each other, and events at school give moms, dads, and kids stress-free opportunities to have fun with each other. Some popular examples include sweetheart dances and potluck nights. To mark an occasion: Back to school, Halloween, winter holidays, Valentine’s Day, and the end of the school year are just a few of the popular times to hold family events with a holiday theme. To support academics and enrichment: Parent groups promote student learning in all kinds of ways, from academic-theme events like Family Reading Night and Family Science Night to art activities like Family Arts & Crafts Night. As a fundraiser: Many community-building events like fun runs and carnivals also serve to raise money for your group. It’s important to balance the number of fundraising activities, even if they’re family events, with events that are purely about building connections and not about raising money. Knowing the “why” behind your event—as well as considering your budget and what’s important to your school community—will help you decide what kind of event to hold. Once you’ve determined what event you want to have, it’s time to figure out how to do it. Here’s what you’ll want to consider for any event you do, from logistics to volunteer needs to finances. A publicity timeline to help spread the word and maximize participation. A comprehensive list of family event ideas to choose from: quick and cheap, creative, for middle schoolers—you name it! Customizable flyers for popular events, plus video instructions on how to create your own event flyers and Facebook graphics.